This picture is of a cargo vessel unloading on the Thames at London. It shows a typical industrial scene of the docks with cranes and a tug and other boats in the for-ground. This picture is very representative of marine art of the 30’s and may have been a commission from the docks or from the shipping line. 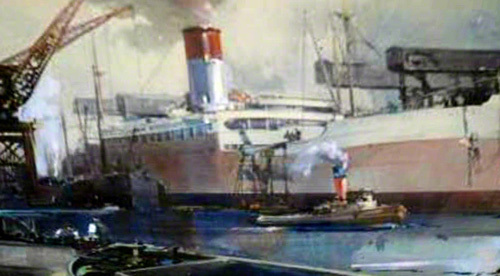 It is believed that Claude Buckle painted a large number of ocean going vessels. He was particularly fond of the sea and a small number of pictures still remain within the family. Created in 1930.